Rebar and Roses: First Tomato! Today I harvested the first tomato of the season, a yellow pear. It was very mild and not as flavorful as some of the other tomatoes that I grow, but it was awfully cute. 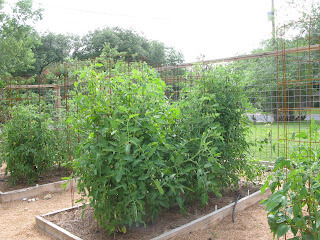 I am growing 30 different varieties of tomato this year and with the exception of Early Girl, they are all heirlooms. I will give regular updates on the taste and productivity of each as the season progresses. So far all of the plants look pretty good, except one sweetpea currant tomato that I had in a hanging basket. I think that it drowned in the rains that we have had this year. Thankfully, I have another one growing in one of my square foot boxes and it looks really happy.